I read this book for my Family Storytime and the children adored it! This is a great book to encourage the use of vocabulary and encourages an open discussion; Columbus Day, Halloween, Thanksgiving, and the State Fair are themes covered. 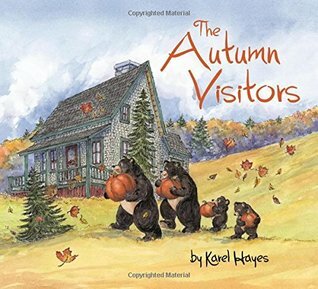 I don't think that this book would work well for a large storytime group, but it's a must read for one-on-one or small storytime groups.SummaryIn this fourth and final book in Karel Hayes's acclaimed Visitors series, the beloved family of bears gets in another round of adventures as they experience the full enjoyment of a New England autumn. First up the country fair--the bears sneak onto the midway after hours to play the games and be thrilled by the rides. Next comes Halloween, for which the bears all cleverly disguise themselves to gather a load of trick-or-treat candy. And finally there's a big Thanksgiving feast for all the friends of the forest. As always, the bears manage to have all their fun while carefully avoiding detection.NotesWatercolor artist and illustrator Karel Hayes has participated in solo, juried, and invitational exhibitions throughout the United States. Her paintings have been shown at the Cincinnati Museum of Natural History, the Fine Arts Center in Taos, New Mexico, and in New York City at the Salmagundi Club, the Catherine Lorillard Wolfe Art Club, and the National Arts Club. Her drawings have appeared in several magazines and she has illustrated more than ten books, including Time for the Fair, The Winter Visitors, and Who's Been Here? A Tale in Tracks. She lives with her husband in Center Harbor, New Hampshire.Subject: Columbus Day, Halloween, Thanksgiving, and the State Fair.Fall Holidays -- Juvenile fiction.Autumn -- Juvenile fiction.Bears -- Juvenile fiction. We picked this book up at the library because I wanted to snag some fall/Halloween books before they were all gone! This book would be perfect for a beginning reader. As a bedtime book for my daughter, it was a little too easy. There were only a few words on each page - at most a sentence. We would linger looking at the pictures a little longer than we would with a wordier book, but really the book was finished much too quickly.My daughter did enjoy the pictures. She loved watching what the bears would do. The story told within the pictures was nice though. I like that the illustrations actually gave us more of the story than the words did. However, since I have a two year old, she is much too young to really grasp the story in the pictures. I tried to point things out like the bears crashing the fair when it closed and the turkeys sitting at the table (rather than cooked on the table like you expected). But it went over her head.So I think this book would be better for older preschoolers and K-1st graders who are learning to read and can also look at the pictures to see what is being told through them as well. It's a neat concept, just not quite right for my 2 year old at bedtime. We'll probably revisit this one in a few years. In this parallel story, a family and a family of bears enjoys all the fall and the countryside have to offer.